The stylish straight radiator pack with RAS-C2 sensor is packaged together with the innovative flow selectable RA-FS 15mm bi-directional valve body which can be mounted either vertically or horizontally in flow or return. If water hammer is experienced a patented unique flow selection device within the valve can be turned to reverse the water direction inside the valve without the need to drain down the system. New style sensor, compact and easy to fit no tools required for a quick and easy solution to an otherwise expensive problem. 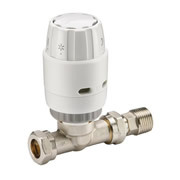 Includes RAS-C2 sensor and RA-FS 15 mm bi-directional straight valve.